One of my favorite types of picture books are nonfiction picture book biographies. I love when authors are able to bring history alive for young readers. It’s what I try to do with so many of my stories. And just this past week, a brand-new one launched and I couldn’t wait to share it with you! And guess what? Debut picture book author, Patricia Valdez, is offering a giveaway of a copy of her book!!!! Big congratulations to her on a fabulous story!!! And make sure to leave a comment – you might be the lucky winner! For fans of Ada Twist: Scientist comes a fascinating picture book biography of a pioneering female scientist–who loved reptiles! Back in the days of long skirts and afternoon teas, young Joan Procter entertained the most unusual party guests: slithery and scaly ones, who turned over teacups and crawled past the crumpets…. While other girls played with dolls, Joan preferred the company of reptiles. She carried her favorite lizard with her everywhere–she even brought a crocodile to school! Fabulous text that takes us from Joan’s childhood days of collecting lizards to her success as a world renowned zoologist. Vivid illustrations that evoke a sense of fun and adventure – kids will LOVE the pictures of all of the lizards and dragons and other animals. A story that will inspire children to dream and be different and go out and learn about science. Talk about different jobs people have who take care of animals: zookeeper, zoologist, beekeeper, groomer, vet, etc. If you could be a reptile, which one would you be? Thank you so much for spending your precious time here. I am working my way through the list of winners of #50PreciousWords, distributing the prizes. Thank you again to all the participants…your stories were fabulous! I know there will be many picture books that emerge from this year’s challenge. Please don’t forget to leave a comment to be eligible to win a copy of this wonderful book, JOAN PROCTER, DRAGON DOCTOR! And remember, the best gift you can give an author or an illustrator is to buy their book, tell someone else about their book, ask your local library to get a copy for their collection and/or leave a review on Amazon, Goodreads or other book review sites. For more super picture book reviews, please hop over to Susanna Hill’s Perfect Picture Book Friday. 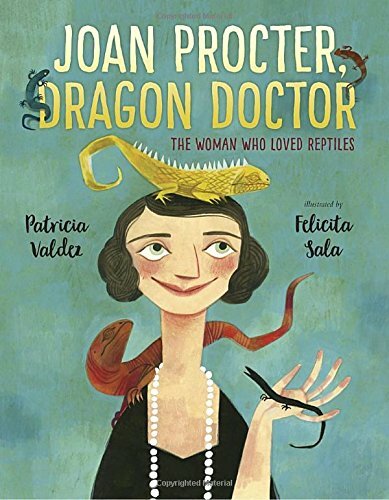 This entry was posted in book giveaway, Perfect Pictture Book Friday, Uncategorized and tagged Alfred Knopf, Felicita Sala, JOAN PROCTER DRAGON DOCTOR, Make a lizard craft, Patricia Valdez, Reptiles, Women Scientists, Zoologist by viviankirkfield. Bookmark the permalink. I’m not in the US so may not qualify for prize, but I am so drawn to this book. Wonderful cover and the story sounds amazing. I am so excited about this book! Thank you so much for posting on it. This book sounds fantastic! I love this genre. I am grateful for trailblazing women like Joan. The juxtaposition of Joan’s pearls and perfectly coiffed hair and her slithering reptiles illustrates Joan’s story perfectly! This looks like a great book! I can’t wait to read this book! I’m always on the lookout for great NF. This looks fantastic, a wonderful topic and the art is so fun. Sounds like a fun read on a non-fiction topic, one that will capture the attention of kids while teaching! Perfect combination. This sounds like my kind of book, Vivian. Learning about someone I did not know about is always a thrill. Love the title—so clever. Thanks for introducing us to Patricia and Joan. I can’t wait to read this book! Joan Proctor sounds like such a wonderful role model for girls! Love stories about women in STEM. Can’t wait to read this one! Congratulations on your book, Ms. Valdez–it looks marvelous! Can’t wait to read and review it on my site. Thanks for bringing it to my attention, Vivian! I never heard of her. Now I am VERY intrigued by both the story and illustrations! This book is on my TBR list. I love how many terrific biographies about women are starting to get their due! I am thoroughly intrigued! The cover illustration makes it that much more fascinating. I cannot wait to read the story of Joan Proctor! Glad this book is receiving a lot of book love! It is such a wonderful biography! I love how this author made a nonfiction topic so much fun. Got to read this excellent mentor text for myself. This sounds fascinating. I have very fond memories of visits to the British Museum & the London Zoo with my kids. I don’t recall any mention of Joan Proctor. Can’t wait to read this book. I especially love the rhyming title. I have never heard about Joan Proctor. What an interesting subject! Can’t wait to read this one! My library didn’t have a copy of this book, so I asked them to purchase it. I love how the opening line – back in the days of long skirts and afternoon tea – sets the perfect visual for the time period. Like everyone who commented before me, I can’t wait to read this book, too. Ooooo! I, too, love a good nonfic biography and this one looks amazing! I love finding new stories to share with my 5 year old son that introduces him to amazing women. Congrats to Patricia Valdez on a fantastic debut! I’ve heard many great things about this book and can’t wait to get my hands on a copy. And thanks always, Vivian, for sharing your fabulous recommendations with us! I can’t wait to request that our library purchase this on biography. Joan is my kind of gal. I used to invite my horned lizard to picnics in the garden with Barbie and crew… I wish I had known about her when I was a kid. Beautiful book & amazing story! So excited to read this, Vivian! I briefly met Patricia at the MD/DE/WV SCBWI conference this past weekend. Thanks for sharing & congrats, Patricia!! I’m intrigued. Why do reptiles need doctors? What a great topic! I love reading biographies and sharing them with others. My son was always bringing me lizards with boo boos to treat! I’ll definitely have to get this book for him! The art is so much fun in this book. Glad to see this review. Thank you!! I too love nonfiction bios of awesome women! And reptiles. Lots of reptiles. Love the title. Nonfiction bios is one of my favorite genres. Can’t wait to get my hands on this one! The cover illustration and summary spark my imagination!